In Turbulence, the world changes forever when all the passengers on a flight from London to Delhi discover they have each gained a superpower that fulfills their deepest desires. Comic book nerd Aman can access the internet and manipulate machines with his mind, fighter pilot Vir no longer needs a plane to fly, and aspiring actress Uzma is now incredibly popular. But of course, some of the new metahumans have less than honorable ambitions, and Aman and his sometime friends may be the only ones who can stop them. They have to try, while also coming to grips with their own transformations, learning to interact with a world that really doesn’t know what to make of them, and deciding just how far they should go to improve that world as they see fit. Unleash the Fanboy: Many American readers are encountering you and your work for the first time. Beyond your official bio, what should they know about you? 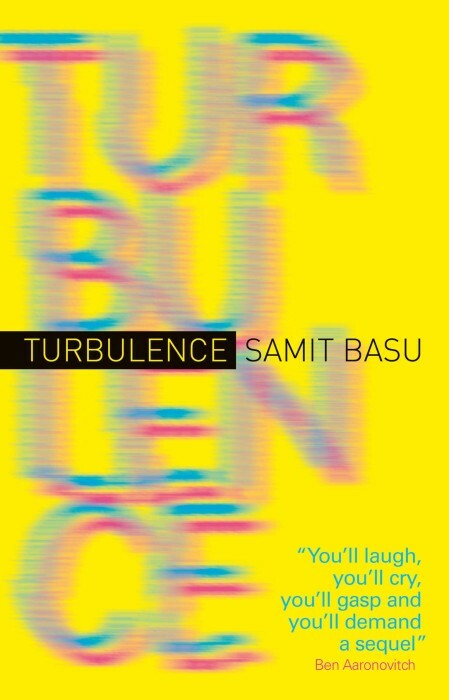 Samit Basu: That it’s absolutely thrilling to have a superhero novel out in the country that really owns the superhero genre; that America isn’t in Turbulence because I haven’t been there yet and wanted to set this book in places I knew well. But America features strongly in Resistance, which is set in 2020, and of course there’s a superhero HQ tower in New York. Also that I hope America will be seeing a lot more of my work, in books, comics, and hopefully films and videogames, and I’m glad my name is short and easy to spell. UtF:What led you to write Turbulence? SB: My first three books were a fantasy trilogy set in an imaginary world, and after seven years of making a world I thought it was time to set something in places I’d lived in and was familiar with. And I finally thought I was ready to write something in India. I wanted to write a story where a group of people found they had the ability to really change the world instead of just complaining about it or seeing their efforts to make things better trickle off into inconsequence: a book where the heroes’ actions had huge consequences, in a part of the world that needed drastic change much more than it needed preserving, and which also dealt with people getting what they really wanted and having to come to terms with that. This led to the idea of physical abilities related to their innermost desires. And because I wanted this book to be as much about here and now as possible, when they got superpowers, it became a superhero book, or a sort of real-world build-from-first-principles superhero book. UtF: Turbulence makes numerous references to pop culture and comic book culture in particular. I got the impression that you, like Aman, have consumed a steady diet of comics. What are some of you favorite series and creators? SB: I actually didn’t grow up reading comics at all: that happened when I was a student in the UK. We didn’t have access to really great comics in India, apart from Tintin and Asterix, and I wasn’t encouraged to read even those: I came from a comic books-are-pointless family of readers. But over the last decade I’ve been reading comics a lot. The favourite creators list is really long, so I’ll just throw in a few names: Alan Moore, Neil Gaiman, Mike Carey, Warren Ellis, Garth Ennis, Brian K. Vaughan, Gail Simone, Brian Bendis. And that’s just the more superhero-fantasy side of things. Favourite series would be pretty much everything these writers have written. Though The Authority, Watchmen, Powers, Supreme Power, Grant Morrison’s JLA and Joss Whedon’s X-Men run were definite influences on Turbulence. UtF: Turbulence offers an Indian perspective on superheroes, which is, to my knowledge, something we haven’t seen here in the States before (we tend to be pretty insulated). How does it differ from an American superhero story? What factors do you have to take into consideration when writing for an Indian audience? Are there stylistic differences from the type of superhero story we’re used to? SB: I’ll try and keep this answer short and to the point. Several differences: The first is that an American superhero story is usually about protecting and preserving the world, with the villain as the agent of change, but I saw no reason to apply that to the Indian subcontinent, where the status quo is really not something that calls for preservation. The second is that the Indian audience is by and large completely ignorant of superhero culture, though that’s changing because of Hollywood. Which is why I decided to abandon most superhero conventions: costumes, secret identities, hero names, though of course I discuss these things in the book as they’re just too much fun to leave out entirely. So it’s a dual approach, really: you have these characters discovering their powers and what to do with them, and the more pop-culture-aware ones are referencing classic superhero situations and conflicts, but for most of them it’s about dealing with the world and their new powers without any context whatsoever. I wanted to write this book for people who didn’t really know their superheroes, but also provide shortcuts and references to people who did, so I didn’t have to reinvent every wheel. I’m not so sure about stylistic differences because I haven’t read enough superhero novels to compare. I did try to make the book slightly comic book like: lots of visuals, lots of action, lots of dialogue, a tight structure, and more novel-like stretches when I was dealing with the ideas and situations that led me to write it as a novel, not as a comic. UtF: How did you come up with this particular means of power acquisition? The character’s desires are crucial in determining what powers they get. Did you invent the characters first, and then extrapolate what their powers would be? Or did you come up with the powers you wanted and then work backwards to develop the characters? SB: I wanted a set of powers that encapsulated what people really want in this part of the 21st century: the book does talk a bit about how old-school Alpha powers are slightly out of date now, especially in terms of making the whole world better. So what came first was thinking about what people wanted, then finding the set of powers I wanted to work with that could come from these desires, and then defining in detail the people who would get those powers. But it wasn’t a wholly separate process because in a sense the people were the powers they got: even finding the powers was about finding people who would want the things that led to them, here and now. Of course this is for the main characters: for some of the cameos and action-specific characters it was more about deciding I wanted to see a power in action visually, and finding a character who might have acquired it. UtF: The world of Aman, Vir, and Uzma is much more closely tied to the real world than the one we see in most comic books. In particular, you place a lot of emphasis on realistic reactions: the reactions of the people discovering they have powers, and the reactions of outside groups, like the government, the media, the general public, and foreign powers. Why was this realism and this focus so important to you? SB: It’s where the whole idea from the book came from: it had to be an Augmented Reality book more than a work of fantasy. But that really came from having spent seven years writing an alternate universe, and wondering what it would be like to write something in places I knew. Also, while I love superheroes, it’s sometimes frustrating to read the stories. All those fabulous powers wasted in fighting each other, all the things they could have set right but didn’t. I wanted to fix that, or at least write people who wanted to look at the real world and see what they could do with it, given their new abilities. And I wanted to see whether their plans would succeed or fail. UtF: Aman, in particular, wants to ensure that the whole situation with the new heroes doesn’t break down into a mindless fist fight, but, this being a superhero story, that almost has to happen. Or does it? Your ending to this first book would certainly suggests that’s the case, but did you have other options in mind? Do you plan to address this more in future books? SB: I’m going to avoid discussing the ending, but a lot of the book is about people trying to bring about change, and failing, and falling into patterns, and trying to break out of those patterns and adapt, at great speed, to strange new circumstances. Which is something that happens in real life all the time, doesn’t it? You muddle your way along, and where you end up usually doesn’t have much in common to where you thought you would. This issue is addressed again in Resistance, of course, when our heroes are more experienced in these matters and the whole issue has just become a part of day-to-day existence for the world. UtF: According to your Wikipedia bio, you, like me, studied economics. Partway through the book, Aman takes matters into his own hands, trying to fix the problems he sees in the world, mostly by redistributing money. I was initially dismayed by this turn of events, because I saw a lot of problems with it. However, I shouldn’t have doubted you because Aman quickly learns that this creates as many problems as it solves. Why did you feel the need to include this sequence of events, and why did Aman need to learn this lesson? SB: As a student of economics, I loved sweeping theories that worked so well in theory, after making equally sweeping assumptions that reduced the world to a state of Lego-like simplicity. Which is kind of like a lot of superhero stories, isn’t it? You assume away the complexities of the world, or the larger implications of your experiment, and play with your toys inside a bubble until you find a perfect solution. In India, like in any other part of the world, I guess, we see many grand plans that usually don’t work at all because of the complexities introduced in the process of actually executing them. I wanted this to be true for the supers as well. I don’t think superhumans can fix the world: I don’t think anyone can, because utopias are like economics models: they only exist if you assume away all problems, and you can’t do that in the real world. What was important for me was not that Aman succeeded in fixing the world’s problems, but that he tried, failed, learned and tried again. UtF: Now for the obligatory question: if you had been on that plane, what power would you have gotten? What power would have fulfilled your heart’s desire? And, because the powers the characters got aren’t necessarily what they would have picked, if you were actually choosing a power, what would it be? SB: Tia’s power. I’d like to be able to split into multiple bodies, never have to make a choice again, and live several lives, do everything, be everywhere, see everything. This is the power I’d choose as well, I think. It would also really help book sales. UtF: I believe Resistance, the sequel to Turbulence, is due out soon in India. Any idea when it will be available to U.S. readers? SB: Summer next year is the plan. It’s out in the UK before that. I’m not sure when it’s out in India, probably around the same time as in the US. Many thanks for having me on your site! UtF: Thanks for talking with us! …and you can find Zac Boone on twitter, too! Lucky you!